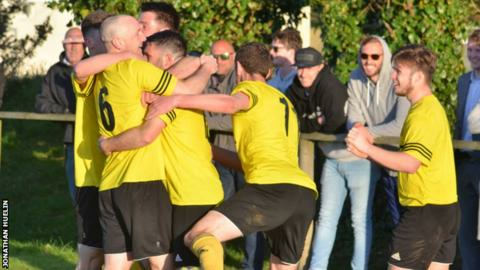 St Paul's are Jersey Premiership champions again after a penalty shoot-out win over Jersey Scottish in a title-deciding play-off. Both sides had finished level on 34 points after the regular season, setting up the extra match. Luke Watson's volley put Saints ahead but Charlie Payn's last-gasp equaliser took it to extra time. Substitute Sam Luce put the Scots ahead but Watson's header left the whole league season hinging on penalties. Scottish scored with their first four spot kicks, but St Paul's goalkeeper Euan Van der Vliet brilliantly saved Ben Gallichan's effort and Watson tucked in the winner. The sides had dominated the Jersey top-flight throughout the campaign, and both got crucial wins at the weekend to force the third play-off in the past decade. After a goalless first half, Watson's well-struck volley on the turn from Craig Russell's cross looked like it would be enough to give Saints their third consecutive title. But in stoppage time Payn headed home to extend the eight-month long campaign by an extra half-an-hour. Luce put Scottish ahead for the first time when he was sent clear and calmly slotted into the corner, but with six minutes left Watson's header from Jack Cannon's free-kick made it 2-2 and took the game to penalties. With the light fading at St Peter the Scottish goalkeeper Craig Fletcher got his hand to Russell's strike but could not keep it out before Van der Vliet tipped Gallichan's penalty wide, and midfielder Watson sealed the Premiership title for St Paul's.